Senyorita Lakwachera: Cebu Pacific Web Check-in Service. Cebu Pacific Web Check-in Service. 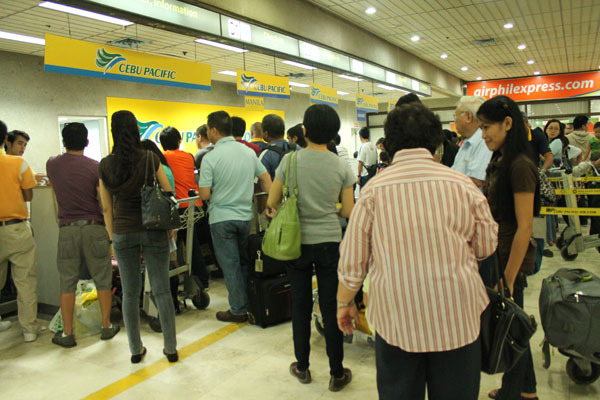 Cebu Pacific Web check-in Service is a new service that gives the option to check in online and avoid the airport counter line as explained on Cebu Pacific's web site. You can web check-in in easy steps. 3. You should be seeing three tabs, first is your booking information and the second is online booking option. 5. Once you're done you have to print your boarding pass. How's the Web check-in for me? Avoid the airport counter line? For me it went close to no diffrence at all! I have three flights but was able to book online for only one flight because i got NO OPTION TO BOOK ONLINE. Why is that so? our two flights are short distance-flight via a small aircraft. That made me confused as well because you won't know it until you call them. But it's fair - I totally agree that they don't accept online bookings for those who have a fligt with small aircraft as they have to limit and double check the bagage-I just wished they indicated it in their instructions. How did the one online booking went? The online booking was pretty much easy to manage so it went well. Avoid the airport counter line? OKAY, 40-50 minutes on Airport counter line; isn't it fair enough? For me it is not fair enough. It is stated on the web site that to those who was able to check-in online can immediately proceed to boarding gate but it is not what happened to all of us who did an online check-in that day. We were instructed to fall in line to have our flight validated, then that is the time that your gate number will be provided since it was not indicated in the online boarding pass. There is nothing wrong with having your flight validated first! The huge mistake was when the online web check-in counter accepting regular check-in with tons of baggage in line - NO Overtaking! you must fall in line! For us we were able to get free seat selection because it goes with their promotion - how about after the promo? Validating the flight took two minutes, I can imagine how fast that line could be if they would make the counter exclusive for those who do web check-in only.